The SGO sponsored their annual Social on Wednesday April 17th, 2019. 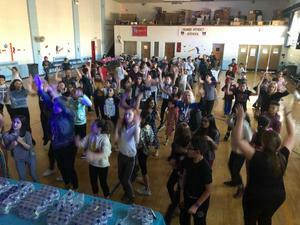 Students in the 4th & 5th grade were able to dance the night away with their peers. A fun time was had by all. Thank you to the SGO , Mrs. Leppin, and Mrs. Stamm for putting on such a fun event. The 3rd Grade students at Huber Street read the novel, “Charlotte’s Web”. They completed writing activities and enjoyed a day of dressing up as characters from the book. 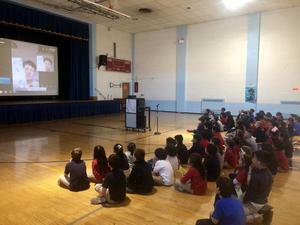 The students also enjoyed the book come to life by watching the movie! 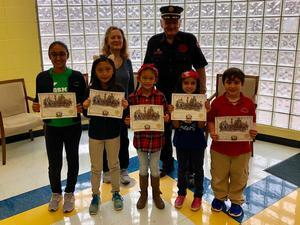 Congratulations to the Huber Street School Fire Prevention Poster Contest winners. Back Row: Mrs. Patrice Phemsint (art teacher) and Fireman George. Mrs. Frank’s class had 15 students in her class raise money for St. Jude’s Children’s Hospital by participating in the annual Math-A-Thon. Mrs. Frank said this is the most she's ever had participate! She rewarded them with a "Lunch Date with the Teacher". 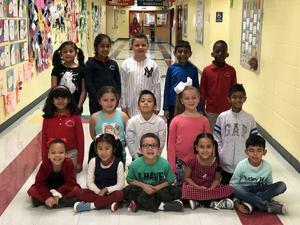 On Tuesday, April 16th, the Huber Street School Dance Club will perform their annual show. Dance along side our talented students. Come in and see us at 7:00 P.M! 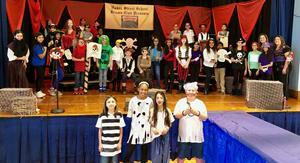 On Wednesday, April 10th, the Huber Street School Drama Club will perform their annual show. This year, they will be presenting “Pirates! The Musical.” Aye matey, come in and see us at 6:00 P.M. Shiver me timbers! Huber Street School had two special visitors today. 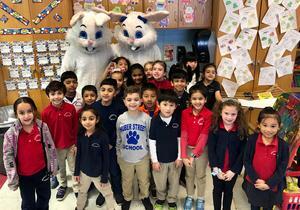 Thanks go to the Secaucus High School sophomore SGO members for bringing the Easter Bunny by. Ms. Phemsint had the first graders participate in The Etch A Sketch Challenge. These students were able to make some artistic creations and pictures with the twist and twiddle of a knob. Mrs. Critelli and Mrs. Viera’s 3rd Grade Classes took part in an “Escape the Room Challenge”. The students worked collaboratively in groups to solve critical thinking puzzles, identify the main ideas of passages, summarize text and answer open-ended questions in order to “ESCAPE PLANET EMOJI.” This activity helped students review important ELA skills, allowed them to work on communication and taught them the importance of teamwork. Each team worked extremely hard, but only one group from each class escaped! Congratulations on Escaping Planet Emoji!